Map of China, Indo-China and part of Malaysia. 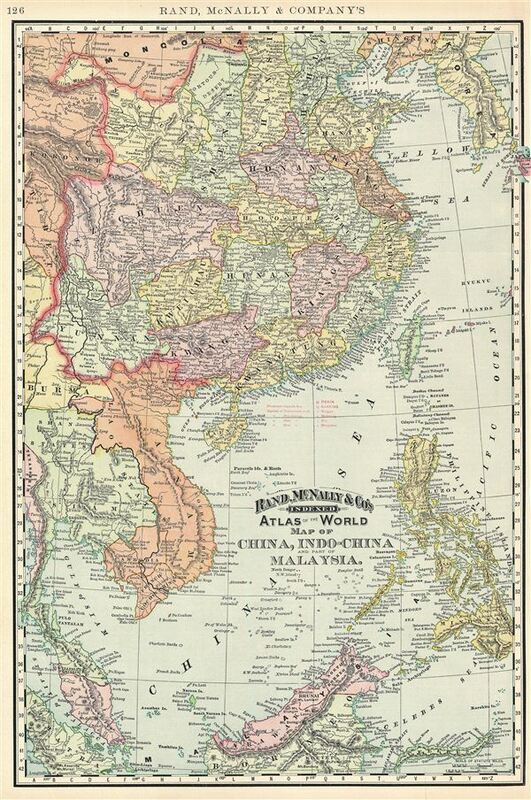 This is a beautiful example of Rand McNally and Company's 1895 map of China, Southeast Asia, and the Philippines. It covers from Korea south as far as Borneo and from Burma to the western tip of Japan. The Malay Archipelago (or east Indies) is here referred to as Malaysia, not to be confused with the modern day country of Malaysia on the Malay Peninsula, which is included here, but not named. Both the Great Wall and the Grand Canal in China are identified. Taiwan or Formosa is mapped vaguely, representing the poor knowledge of the region prior to the Japanese invasion and subsequent survey work in 1895. As this map was drawn, Imperial China wilted under the weak Qing Dynasty while in 1893, the Franco-Siamese War was about to break out between the Kingdom of Siam and the French Republic. This would ultimately result in the secession of Laos to the French. Color coded according to provinces and regions, the map notes several towns, cities, rivers, mountains and various other topographical details with relief shown by hachure. This map was issued as plate no. 529 in the 1895 issue of Rand McNally and Company's Indexed Atlas of the World - possibly the finest atlas Rand McNally ever issued. Rumsey 3565.033 (1897 edition). Philip (atlases) 1026 (1898 edition).